We want you to be able to create the code that you need from your UML models. That’s why we’re thrilled to introduce the first version of our custom code generator. If you follow us on Google+ or Twitter, you may have already heard about our new feature in GenMyModel and tried it out. 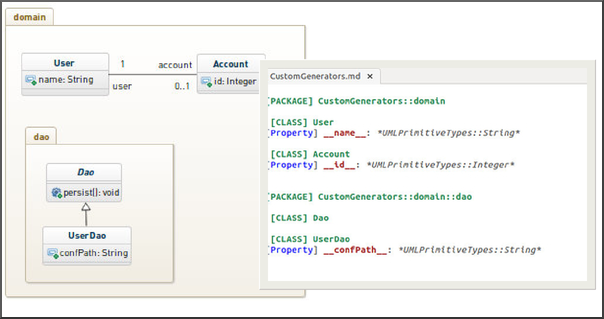 We’ve just released a beta version for custom code generators in GenMyModel. It allows you to use your own Acceleo template and generate code from your UML models. Custom code generators in GenMyModel use Acceleo. Acceleo is a template-oriented code generator based on MTL syntax. It takes models as inputs and produces any kind of code. Take a look at our quick start guide to learn more. We’d love for you to test it out and let us know what you think! And of course, if you have any questions or need help, leave us a comment or send us a message.